We are offering a new, FDA approved, less traumatic treatment for periodontal disease. 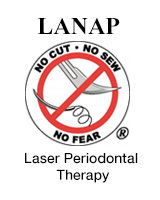 LANAP (Laser Assisted New Attachment Procedure) utilizes safe and proven laser technology to gently remove harmful bacteria and diseased tissue from the gums. With this new procedure, only the diseased tissue is removed and the height of the tissue around the tooth is maintained. LANAP controls periodontal disease and makes it possible to save and restore healthy teeth that may otherwise have to be extracted. The only FDA approved laser-based treatment for gum disease. This removal of bacteria allows the body to heal naturally so the gum pockets improve and the teeth become more stable. But, with LANAP, there is less pain and since the gum tissue is not cut with a scalpel, there are no stitches, minimal bleeding, and a quicker, much easier recovery. LANAP is the only procedure that actually helps the bone supporting your teeth to regenerate. This laser-based approach to treating gum disease makes it easier for you to return your gums to health and the process is far more comfortable than gum surgery. Safe for patients with health concerns such as diabetes, HIV, hemophilia, or those taking medications such as Coumadin or Cyclosporin.